The Off-Road and Mining Industries have presented difficult challenges to researchers in fighting the effects of corrosion—in economic loss and environmental safety. The Cortec® corrosion engineers understand that each facilty has a different atmosphere thus exposed to very different corrosive environments. Selecting the right products to protect structures against corrosion is key in order to ensure longevity of the equipment, as well as good performance regardless of what metal or minerals are being extracted. Cortec® is prepared to create a unique plan to fight and prevent corrosion-related problems in the Off-Road and Mining Industries, using industry leading products. Cortec® products have been developed using proprietary VpCI® Technology. Cortec® VpCIs are a safe, cost-effective method for preventing and diminishing the severe damage caused by corrosive process streams. Whether a company is concerned with maintenance painting to prevent corrosion, or more serious corrosion problems affecting personal safety and continuation of production; Cortec® provides highly efficient and economical corrosion protection for the Off-Road and Mining Industries. Vapor phase Corrosion Inhibitors (VpCI's) offer an environmentally safe method of treatment with low toxicity and low polluting effects. Unlike corrosion inhibiting systems of the past, many of Cortec® VpCI's do not contain chromates or other heavy metals, nitrites, or chlorinated hydrocarbons. With Cortec® VpCIs you can turn the tables on corrosion. With the support of our corrosion scientists, engineers, and testing facility, Cortec® can provide simple, environmentally friendly, cost-effective solutions for any corrosion problems. PRESS RELEASE: Case Histories Highlight Success of Cortec® Water-Based Rust Preventatives for Nearly Two Decades! FEATURED IN: Cortec® VpCI® Corrosion Protection Strategies for Valuable Mining Assets Featured in Expacios Magazine! NEW PRODUCT RELEASE: Cortec® Introduces the Next Generation of Corrosion Inhibiting Fuel Additives! FEATURED IN: Cortec Launches New Eco-Friendly Lubricant Featured in Gulf Industry Magazine! FEATURED IN: Cortec Launches New Eco-Friendly Lubricant Featured in Trade Arabia Magazine! FEATURED IN: Premium Cortec® M-540 Additive Enables Bio-Based and Ester-Based Greases to Pass Rust Prevention Test in 5% Seawater Featured in Construction Technology Magazine! PRESS RELEASE: Cortec&REG; Releases Unique VpCI&REG; Additives Brochure for Fuels, Crude Oil, and Natural Gas! FEATURED IN: Cortec® Designs Corrosion Inhibiting Additive Compatible with Diesel Fuel Tanks and Systems Featured in IPCM Magazine! FEATURED IN: Corrosion Inhibiting Additive for Diesel Fuel Systems Featured in New Equipment Digest Magazine! PRODUCT RELEASE: Cortec® Designs Corrosion Inhibiting Additive Compatible with Diesel Fuel Tanks and Systems! FEATURED IN: EcoAir VpCI-337 Fogger Featured in Heavy Construction Magazine! FEATURED IN: Cortec CorrLube VpCI Lithium EP Grease Featured in World Coal Magazine! FEATURED IN: Cortec Highlights Eco Tire Duragloss Featured in Fleet Equimpent Magazine! FEATURED IN: Cortec Launches CorrLube™ VpCI® Lithium EP Grease Featured in Mine Listings Magazine! FEATURED IN: Cortec EcoAir Featured in Heavy Equipment Guide! NEWS ALERT: Cortec® Attends The 2016 Caterpillar Corrosion Engineering Conference! FEATURED IN: CorrLube VpCI Lithium EP Grease Featured in Cutting Tool Engineering Magazine! NEWS ALERT: Cortec® Attends Exponor 2015 As The Only Corrosion Prevention Solution For The Mining Industry! PRESS RELEASE: Cortec's New “VpCI® Technology for Off-Road Equipment and Mining Industries" Brochure Now Available! FEATURED IN: New Micronutrient Blend for Superior Soil and Wastewater Bioremediation Featured in Mining Weekly Magazine! 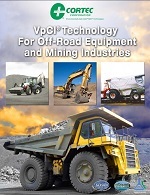 VpCI® Technology for Off-Road Equipment and Mining Industries!